Square 55/September 1, 2016: Work on floors 7 and 8 were substantially completed in mid-July, with punch list work and move activities occurring throughout August in preparation for the beginning of the academic year. With the completion of the build out of the shell space on floors 7 and 8 the construction at SEH is now completed. Square 55/July 1, 2016: Work on floors 7 and 8 is coming to a conclusion. The contractor is working on the last of the interior finishes. Furniture installation has begun. The commissioning process is ongoing to check the functionality of the HVAC and electrical work. Substantial completion is anticipated for mid-July. Final punch list items and the occupant move is anticipated for early August. Square 55/June 1, 2016: Interior work is progressing on both the 7th and 8th Floors along with final testing and balancing of the mechanical systems. Lab furniture and fume hoods have been installed as well as doors and hardware. Flooring has started on the 7th Floor and should start on the 8th Floor later this month. Final paint and punch list work is also targeted for the middle of June. Square 55/May 1, 2016: Interior finishes continue on both the 7th and 8th Floors along with ongoing mechanical, electrical and plumbing work. Lab furniture and fume hoods have been installed on the 7th Floor and will begin on the 8th Floor. Doors and hardware have also begun. Flooring and painting will begin this month. Square 55/April 1, 2016: Interior finishes have begun on the 7th Floor as well as some areas on the 8th Floor. A majority of the ceiling grid is installed in the 7th Floor. Mechanical, electrical and plumbing work is continuing on both floors. Lab furniture and fume hoods have also arrived on site and are being installed. Doors and hardware installation should begin this month. Square 55/March 2, 2016: Mechanical, electrical and plumbing rough-in is ongoing on both floors. Duct mains and lab racks continue as well. Wall construction has begun with the installation of studs throughout the 7th Floor as well as beginning on the 8th Floor. Interior glass installation will begin in coming weeks. Square 55/February 11, 2016: So as to minimize impacts on daytime activities, work in selected areas of SEH building will be taking place during evening and night hours. It is not anticipated this work will create any noticeable impacts for occupants or individuals in/near the building. Square 55/February 2, 2016: Lane closures are scheduled on the east side of 23rd Street on Friday, February 5 and Friday, February 19 to facilitate material load in of floors 7 and 8 of the Science and Engineering Hall by way of a crane. The closure is scheduled from 5am until 7pm each day. During that time 23rd Street will be reduced to 1 lane of traffic in each direction, the east sidewalk will be closed, as will the 23rd Street SEH entrance. Square 55/February 1, 2016: Work is now underway on the building of the top two floors (7 and 8) of the Science and Engineering Hall with mechanical, electrical and plumbing (MEP) rough in ongoing on both floors. Duct mains and lab racks continue as well. Wall construction has begun with the installation of studs throughout Floor 7 and is beginning Floor 8. Interior glass is schedule to arrive on site in the next few weeks and that installation will begin. Square 55/March 13, 2015: The project was substantially completed November 20, 2014 and followed by several months or move-in and punch-list work. A grand opening celebration was held March 4, 2015. Minor construction/work activities may continue for several more months as faculty and staff continue to get settled into their spaces. All work has been scheduled to take place in the early mornings and evenings to minimize disruptions to classes. This will be the last construction update until work begins on shell build out of levels 7 and 8. Square 55/February 25, 2015: Minor construction/work activities continue to take place at SEH. While the building is substantially complete and open, there are a few more tasks to complete (signage installation, cosmetic touch-ups, etc.). Work has been scheduled to take place in the evening to minimize disruptions to classes. Square 55/January 16, 2015: The building opened for spring semester classes on January 12, 2015, and the building's garage opened on January 5, 2015. Work on the interior finishes and lab spaces are substantially complete; however, work activities continue to make the spaces fully complete. Public sidewalks have all been completed and opened. The courtyards behind Fulbright and Munson Halls will be completed this month. The next update will be March 1, 2014. Square 55/December 1, 2014: The building received its Certificate of Occupancy on November 21 and occupants will begin to move-in this month. However, the building will not be open to students or the public until January 12, 2015. Building entry is limited to authorized personnel only. The date for opening the parking garage will be posted as soon as it is finalized. Work on the interior finishes and lab spaces are substantially complete, however final work activities continue to make the spaces fully complete. Public sidewalks have all been completed and opened. The courtyards behind Fulbright and Munson Halls will be completed this month. This will be the last project update for 2014. We will resume updates in early January. Square 55/November 1, 2014: Interior finishes and laboratory casework are nearing completion throughout the building. Work on the specialty lab spaces, to include the clean rooms and the shielded rooms, is also nearing completion. The exterior terra cotta rain screen installation is finishing up in the loading dock area, and the exterior signage will be installed this month. Site work and landscaping on both 22nd Street and on H Street are ongoing and will be completed later this month. Furniture deliveries are arriving on site between 7pm - 9pm. Trucks being used for these deliveries will likely remain in the loading dock as late as midnight. The next update will be on December 1, 2014. Square 55/October 1, 2014: Interior finishes and laboratory casework are ongoing throughout the building, and several areas are nearing completion. Work on the specialty lab spaces, to include the cleanrooms and the shielded rooms, is still underway. The exterior terra cotta rain screen installation between the window areas is progressing and will continue around the building perimeter, finishing this fall. Underground utility work continues on Eye Street and will be completed this month. The courtyard loading dock is in the process of becoming the primary loading dock for all deliveries to the building. Beginning, in early October, furniture deliveries will arrive on site between 7pm - 9pm. Trucks being used for these deliveries will likely remain in the loading dock as late as midnight. These deliveries will continue through November. Site-work around the eastern half of the site is ongoing. The next update will be on November 1, 2014. Square 55/September 10, 2014: Interior finishes and laboratory casework are ongoing throughout the building, and several areas are nearing completion. Work on the specialty lab spaces, to include the cleanrooms and the shielded rooms, is still underway. The exterior terra cotta rain screen installation between the window areas is progressing and will continue around the building perimeter, finishing this fall. Underground utility work continues on Eye Street. This month the courtyard loading dock will become the primary loading dock for all deliveries to the building. Site-work around the eastern half of the site is ongoing. The next update will be on October 1, 2014. Square 55/ August 5, 2014: Interior finishes and laboratory casework are ongoing throughout the building. Work on the specialty lab spaces, to include the cleanrooms and the shielded rooms, is still underway. The exterior terra cotta rain screen installation between the window areas is progressing and will continue around the building perimeter, finishing in early fall. Underground utility work continues in the courtyard off of Eye Street, between the JBKO and Munson Halls. This month the courtyard loading dock will become the primary loading dock for all deliveries to the building. Site-work is ongoing in front of the residence halls on H and Eye Streets, as well as 23rd Street to complete sidewalk work. These sidewalks will open later this month, and the landscaping in these areas will be completed in September. Work will take place on Sunday, August 17th to ensure on-time completion of sidewalks. Site-work around the eastern half of the site is starting this month. The next update will be on September 1, 2014. Square 55/ July 3, 2014: Interior finishes are ongoing throughout the building, and installation of laboratory casework began in June. Work on the specialty lab spaces, to include the cleanrooms and the shielded rooms, is underway. The exterior terra cotta rain screen installation between the window areas is progressing and will continue around the building perimeter finishing in early fall. Underground utility work is continuing in the courtyard off of Eye Street between the JBKO and Munson Halls. Site-work is ongoing in front of the residence halls on H and Eye Streets and will begin on 23rd Street this month. Site work around the east half of the site will begin in August. The next update will be on August 1, 2014. Square 55/ June 9, 2014: The HVAC system was activated last month to support the building’s interior finishes. Mechanical, electrical, and plumbing (MEP) installation inside walls and above ceilings on levels 1 and 6 is ongoing, and has largely been completed on the other floors. Ceiling grid activities are ongoing on levels LL2, LL1, 2, 3, and 4 this month. Storefront around the perimeter of the 1st floor is completed. The terra cotta rain screen installation between the window areas began on the north and east elevations of the project and will continue around the structure into late summer. Underground utility work is continuing in the courtyard off of Eye Street between the JBKO and Munson Residence Halls. Site-work and landscaping began around the perimeter of the site last month and will continue into the fall; this work began in front of Fulbright Hall and will shift to the area in front of Munson and JBKO Halls in late June. The next update will be on July 1, 2014. Phase 1 will begin on May 19 and will last until mid June. It is located on H Street in front of Fulbright Hall. Phase 2 is the south side of I (Eye) Street in front of JBKO Hall and part of Munson Hall. It is anticipated to begin mid-July and last through mid-July. Phase 3 is the east side of 23rd Street and is anticipated to begin mid-June and last through mid-August. Phase 4 is the remaining part of the I (Eye) Street sidewalk (between 22nd and 23rd Streets) not covered in Phase 3. It is anticipated to begin in mid-July and last through mid-August. Phase 5 and Phase 6 will include all of the west side of 22nd Street and is anticipated to start in mid-August and last through mid-September. Phase 7 will cover the portion of the H Street sidewalk (between 22nd and 23rd Streets) that was not included in Phase 1. It is anticipated to being in mid-September and be completed in mid-October. Any street or sidewalk closures associated with work will be posted on the Lane and Street Closures page as permits are received. Square 55/ May 7, 2014: The HVAC system will be started this month and will supply cool air to the building. Mechanical, electrical, and plumbing activities inside walls and above ceilings are being completed on LL2, LL1, 2 and 3 and are continuing to progress on levels 1, 4, 5, and 6. Interior wall framing is mostly complete on levels LL2, LL1, 2, 3, 4, and 5 and is continuing to progress on Levels 1 and 6. Ceiling grid is ongoing on levels LL2, 2 and 3 this month. Storefront around the perimeter of the 1st floor is anticipated for a May completion. The terra cotta rain screen installation between the window areas has begun on the north end of the project and will continue around the structure into late summer. Underground utility work is continuing in the courtyard off of Eye Street between the JBKO and Munson Residence Halls. Site-work and landscape will begin around the perimeter of the site beginning this month and continuing into the fall. This work will begin in front of Fulbright Hall and continue clock-wise around the block. The next update will be on June 1, 2014. Square 55/April 2, 2014: The air handling units have all been set on the roof and efforts are ongoing to get them started up early next month. Mechanical, electrical, and plumbing activities are continuing to progress in the garage and up through Level 8. Interior wall framing is in progress on all levels and the gypsum wall board installation has begun on levels LL2 and 2. The exterior glass building enclosure is completing at level 8 and the ground floor storefront is ongoing this month. Between the glass areas the metal framing, sheathing, and air vapor barrier are ongoing and should be finishing next month. The terra cotta rain screen installation between the window areas has started and will continue into late summer. The next update will be on May 1, 2014. Square 55/March 4, 2014: Eight of the ten air handling units have been set on the roof and the remaining two units will be set this month with a mobile crane. Mechanical, electrical, and plumbing activities are continuing to progress in the garage and up through Level 8. Interior wall framing is in progress on all levels and the gypsum wall board installation will begin this month on level 2. The exterior glass building enclosure is complete on Level 6, and Levels 7 and 8 will complete this month. In April exterior glass enclosure work will move to the ground floor. Between the glass areas the metal framing, sheathing, and air vapor barrier are progressing in multiple areas. The terra cotta rain screen between the window areas will start in March and continue into the summer. The next update will be on April 1, 2014 unless otherwise needed for additional activities that may impact the campus. Square 55/February 6, 2014: The penthouse structure completed in January. Ongoing work of the penthouse enclosure includes mechanical, electrical, and plumbing rough-in, as well as equipment installation. Three of the air handling units have been set on the roof, five more will be set this month, and the remaining two should be set next month. Mechanical, electrical, and plumbing activities are continuing to make progress in the garage and up through Level 8. Interior wall framing has begun on Level 2 and will continue on Level 3 this month. The exterior glass building enclosure is underway on Level 6 and the metal framing, sheathing, and air vapor barrier around the glass curtain wall are ongoing as well. Square 55/January 6, 2013: The roof structure is complete and the penthouse roof structure is planned for completion by the end of January. Interior partition framing and mechanical, electrical, and plumbing activities are continuing to make progress in the garage and up through Level 6. This month utility work will continue on 22nd Street and also transition back to 23rd street through the end of January. The exterior glass building enclosure is ongoing on Levels 1 thru 5. So as to facilitate removal of construction site project trailers, the parking lane on the north side of the 2100 block of Eye Street will be closed Tuesday January 14 and Wednesday January 15. The next update will be on February 3, 2014 unless otherwise needed for additional activities that may impact the campus. Square 55/December 5, 2013: The Floor 8 structure is completed, the roof structure is approximately 50% complete, and the penthouse roof structure is planned for completion by the end of December. Interior partition framing is beginning on levels LL2, LL1, 2 and 3. Mechanical, electrical, and plumbing activities are continuing to make progress in the garage and up through Floor 6. Underground utility work has shifted to 22nd Street and will continue through December. The exterior glass building enclosure has begun at levels 1 and 2 and will continue on levels 3 and 4 in the month of December. To facilitate removal of the crane at the north end of the project site, 22nd Street between H and Eye Streets will be closed beginning the morning of December 21 and continuing through December 22nd. This work is permitted to begin before and continue after standard work times and is not anticipated to create noticeable impacts for area residents. The next update will be on January 6, 2013 unless otherwise needed for additional activities that may impact the campus. Work to facilitate utility (water) connections to the new Science and Engineering Hall around the site which necessitated some temporary lane closures in recent months is now complete. There will be no construction on December 25 and on January 1, 2014. Square 55/November 7, 2013: The Floor 6 structure is completed, the Floor 7 structure is approximately 50% complete, and the scaffold/framing has begun for Floor 8. Interior partition framing is underway. Mechanical, electrical, and plumbing activities are continuing to make progress in the garage and up through Floor 4. Underground utility work has progressed along 23rd Street and will shift to 22nd Street later in November. Preparations are ongoing for the building enclosure have begun and erection of glass exterior will begin in November. To facilitate installation of a stairway, permits have been issued for work after standard 7:00 p.m. ending time for construction between November 22-December 2 that is not anticipated to create noticeable noise. The next update will be on December 2, 2013 unless otherwise needed for additional activities that may impact the campus. Work will not take place at the site from November 29 through December 1. Square 55/October 20, 2013: Installation of a new hoist at the Science and Engineering Hall will require additional work hours this Sunday, October 20, 2013. Although not anticipated to cause traffic delays or create noise impacts, this work will be occurring outside of the typical 7am-7pm Monday-Saturday timeframe. Square 55 Lane Closure/October 5, 2013: The 2200 block of H Street will be closed for equipment delivery at the Science and Engineering Hall project site. Also, work has been permitted to continue past standard 7:00 p.m. on this day. Square 55/September 30, 2013: The Floor 4 structure is completed, the Floor 5 structure is approximately 50% complete, and the scaffold/framing has begun for Floor 6. Interior partition framing will begin next month. Mechanical, electrical, and plumbing activities are continuing to make progress in the garage and up through Floor 4. Underground utility work has progressed along 23rd Street and will continue through next month. Utility work on 22nd Street is scheduled for November. Preparations are ongoing for the building enclosure to begin this fall. The next update will be on October 31, 2013 unless otherwise needed for additional activities that may impact the campus. Square 55/August 30, 2013: The second floor structure is completed, the third floor structure is approximately 50% complete, and the scaffold/framing has begun for the fourth floor. Mechanical, electrical, and plumbing activities are continuing to make progress in the garage and lower levels 1 & 2. Underground utility work has progressed along 23rd Street and will continue through next month. Preparations are ongoing for the building enclosure to begin this fall. The next update will be on September 30, 2013 unless otherwise needed for additional activities that may impact the campus. Square 55 July/August: So as to facilitate utility (water) connections to the new Science and Engineering Hall, the following temporary lane closures will occur around the project site in phases: 1) July 22-August 2: Utility connection work begins with portions of the 2200 block of H Street closed; 2) Apx. August 12-16: Work will occur at 23rd Street to make utility connections to JBKO Hall; 3) Apx. August 19-30: Utility connections will proceed to the 22nd & H Streets intersection and then north to 22nd and I Streets, both requiring a lane closure during daytime hours; 4) Remaining dates tbd -- final connections along the 2200 block of Eye Street and other portions of 23rd Street will occur following this work as will associated paving repairs. Required water shutdowns during these phases of work will occur at night and be coordinated with any impacted buildings. All lane closures will be facilitated by safety personnel. This work schedule is subject to change (weather, and field unknowns) and will be updated periodically as information becomes available. Square 55/July 29, 2013: Below grade (ground) structure is complete with a substantial portion of the ground floor structure up to the second floor also complete. Work is now progressing on the second floor and includes setting shoring and wood formwork, placing reinforcement and in-slab utilities, pouring concrete, removing formwork, and ultimately removing the shoring. Mechanical, electrical, and plumbing activities are heavily underway in the garage and Lower Levels 1 & 2. The removal of the cross lot bracing on the lower levels of the west wing is underway and will be complete over the next month allowing concrete activities to move up the building. The next update will be on August 26, 2013 unless otherwise needed for additional activities that may impact the campus. Square 55/June 25, 2013: Below grade work continues toward grade (ground) level with initial work completed on the four below grade levels of parking and the two below grade academic floors (LL2 and LL1). Work is now progressing on the ground level floor and includes setting shoring and wood formwork, placing reinforcement and in-slab utilities, pouring concrete, removing formwork, and ultimately removing the shoring. Mechanical, electrical, and plumbing workers will follow the concrete work with early rough-in activities. Since work during the next month will be similar in pattern, the next update will be on July 29, 2013 unless otherwise needed for additional activities that may impact the campus. Square 55/May 17, 2013: Below grade work continues toward grade (ground) level with initial work completed on the four below grade levels of parking and the first of two below grade academic floors (LL2). Work is now focused on the last remaining below grade floor (LL1). There will be work at this project site outside the standard 7am-7pm permitted hours on Wednesday, May 29 beginning at 7:00 p.m. and lasting until approximately 1:00 a.m. So as to minimize impacts on area pedestrian and vehicular traffic, Clark Construction has received approval to work during these hours to complete concrete work on the strong floor. Any occupants of Fulbright and JBKO/Munson residence hallas are urged to keep their blinds down during this night. There should not be any additional lighting used during this period but there may be an increase in construction-related noise in the immediate vicinity. Ongoing concrete activities for below grade walls, columns, and slabs on floor LL1 include setting shoring and wood formwork, setting reinforcement and in-slab utilities, pouring concrete, removing formwork, and ultimately removing the shoring. Mechanical, electrical, and plumbing workers will follow the concrete work with early rough-in activities. Since work during the next month will be similar in pattern, the next update will be on June 21, 2013 unless otherwise needed for additional activities that may impact the campus. Square 55/June 1, 2013 Traffic Alteration Notice for 23rd Street: So as to facilitate ongoing construction Science and Engineering Hall, three northbound vehicular lanes on the eastern side of 23rd Street (midblock between H and Eye Streets) will be re-directed on Saturday June 1. During this time, traffic will be two-way (one lane each direction) and the sidewalk adjacent the work area (on the east side of 23rd Street) will be closed. This permitted work will begin and end outside of the standard work hours (7am-7pm) and is dependent on weather. Square 55/April 26, 2013: Ongoing concrete activities for walls, columns, and slabs will continue as structure work progresses upward through the fall of 2013. This work includes setting shoring and wood formwork, setting reinforcement and in-slab utilities, pouring concrete, removing formwork, and ultimately removing the shoring. Mechanical, electrical, and plumbing workers will follow the concrete work with early rough-in activities. Currently this work is focused on floors LL2 and LL1. Since work during coming months will be similar in pattern, the next update will be on May 17, 2013 unless otherwise needed for additional activities that may impact the campus. Square 55/March 29, 2013: Ongoing concrete activities for walls, columns, and slabs will continue as structure work progresses upward through the fall of 2013. This work includes setting shoring and wood formwork, setting reinforcement and in-slab utilities, pouring concrete, removing formwork, and ultimately removing the shoring. Mechanical, electrical, and plumbing workers will follow the concrete work with early rough-in activities. Currently this work is focused on floors G1 and LL1. Since work during coming months will be similar in pattern, these bi-weekly updates are being reduced to monthly with next update on April 26, 2013 unless otherwise needed for additional activities that may impact the campus. Square 55/March 1, 2013: Excavation of footings in the north wing is complete in preparation for placing the footings. Ongoing concrete activities for walls, columns, and slabs will continue as structure work progresses upward through the fall of 2013. This work includes setting shoring and wood formwork, setting reinforcement and in-slab utilities, pouring concrete, removing formwork, and ultimately removing the shoring. Mechanical, electrical, and plumbing workers will follow the concrete work with early rough-in activities. Currently this work is focused on floors G2 and G1. Since work during coming months will be similar in pattern, these bi-weekly updates are being reduced to monthly with next update on March 29, 2013 unless otherwise needed for additional activities that may impact the campus. Square 55/February 15, 2013: Excavation of footings in the north wing is underway in preparation for placing the footings. Ongoing concrete activities for walls, columns, and slabs will continue as structure work progresses upward through the fall of 2013. This work includes setting shoring and wood formwork, setting reinforcement and in-slab utilities, pouring concrete, removing formwork, and ultimately removing the shoring. Mechanical, electrical, and plumbing workers will follow the concrete work with early rough-in activities. Currently this work is focused on floors G2 and G1. Square 55/January 31, 2013: Excavation of footings in the north wing is underway in preparation for placing the footings. Ongoing concrete activities for walls, columns, and slabs will continue as structure work progresses upward through the fall of 2013. This work includes setting shoring and wood formwork, setting reinforcement and in-slab utilities, pouring concrete, removing formwork, and ultimately removing the shoring. Mechanical, electrical, and plumbing workers will follow the concrete work with early rough-in activities. Currently this work is focused on floors G3 and G2. Square 55/January 18, 2013: Excavation of footings in the north wing is underway in preparation for placing the footings. Ongoing concrete activities for walls, columns, and slabs will continue as structure work progresses upward through the fall of 2013. This work includes setting shoring and wood formwork, setting reinforcement and in-slab utilities, pouring concrete, removing formwork, and ultimately removing the shoring. Mechanical, electrical, and plumbing workers will follow the concrete work with early rough-in activities. Currently this work is focused on floors G3 and G2. Note: Per government regulations related to the President’s Inauguration, work will not occur on this or other GW construction sites on Monday, January 21, 2013. Square 55/January 7, 2013: Recent and upcoming work includes: Continuation of ramp removal excavation east of Munson Hall as well as preparation for footing and slab on grad work and completion of slab on-grade work in early January. Ongoing concrete activities for walls, columns, and slabs will continue as structure work progresses upward through the fall of 2013. This work includes setting shoring and wood formwork, setting reinforcement and in-slab utilities, pouring concrete, removing formwork, and ultimately removing the shoring. Mechanical, electrical, and plumbing workers will follow the concrete work with early rough-in activities. Square 55/December 11, 2012: Recognizing the importance of the upcoming December 12-21 Final Exams period, the university is extending the prohibition on construction activities likely to be exceptionally noisy to 9:00am on weekdays at the sites for all of GW’s major construction projects, including the Science and Engineering Hall site. Workers can work from 7–9:00am during this time, but the work may not include activities that are defined in this letter to students (.pdf) dating December 10, 2012 – regular work may commence after 9:00 a.m. Also, work will not occur at these sites on Saturday December 15, 2012. Recent and current work continues throughout the site, including: northeast section – installation of second tower crane in early December, completion of footings, begin waterproofing at shotcrete walls, being rebar at continuous wall footings; northwest section – on Level G3, building scaffolding and alumna beams, followed by installation of rebar and concrete pour; southeast section – begin pouring foundation walls and installation of under slab drainage work; southwest section – begin building scaffolding/alumna beam deck system. Unless otherwise needed, the next project update for this site will be posted the first week of January 2013. Square 55/ December 5, 2012: Temporary Road Closure of 22nd Street between H & Eye Streets beginning 4:00 a.m. Friday December 7 and continuing through midnight Sunday December 9 for the purpose of removing existing excavation equipment and installation of a second tower crane. Although a permit has been obtained so work may occur outside the 7 a.m.-7 p.m. standard work hours (if needed), this work is not anticipated to be exceptionally noisy. Personnel and signage will be posted in the area to assist with pedestrian and traffic control. Adjacent sidewalks are not anticipated to be closed during this time. Square 55/ November 30, 2012: Recent and current work continues throughout the site, including: northeast section - complete lower level footing and shotcrete work; northwest section - framing for first elevated deck; southeast section - slab on grade work, northeast section - preparation for slab on grade work. section -underslab drainage work; southeast section - column installation work, northeast section - footing excavation/construction work. Square 55/ October 31, 2012: Recent and current work continues throughout the site, including: northeast section – continued removal of remaining rock and soils in the area of the previous truck entry ramp and shotcrete installation along the foundation wall as well as initial footing work; northwest section - continued pouring foundation walls and columns and begin drainage installation; southwest section –continued pouring foundation walls/columns; southeast section – continued installation of wall rebar. Square 55/ October 15, 2012: After the controlled blast earlier this week, blasting activities are now completed at this site. On the northeast portion of the project site, work continues to remove remaining rock and soils in the area of the previous truck entry ramp as does shotcrete installation along the foundation wall. There are still several lifts of rock and shotcrete to get to subgrade in the northeast corner. Steel to be delivered later this week. On the northwest portion of the site, underground plumbing inspection is complete. On the southwest portion of the site, rebar installation continues at foundation walls. On the southeast portion of the site, column steel and footing installation is underway. Square 55/October 1, 2012: One of the remaining final controlled blasts is scheduled for Wednesday October 3, 2012 at 11:00 a.m. It will be determined after this blast if remaining blasts are necessary. Project work on the site over next two weeks includes: Fulbright area - sump pit installation and initial underground plumbing work; H Street west - continue pouring wall footings and begin wall/column rebar installation; H Street east - continue installation of rebar in interior footings as well as interior/wall footings; rebar installation; 22nd Street north - continue removal of former vehicle ramp; Eye Street mid-block - continue rock excavation and opening interior footings. Square 55/September 18, 2012: Several controlled blasts are likely within the next few weeks as this phase of work concludes. Project work on the site over next two weeks includes: Fulbright area – continued concrete work on foundations: H Street west – continue waterproofing and installing footing rebar; H Street east – continue excavation of footings and begin interior footing rebar installation; 22nd Street north – complete removal of former vehicle ramp. Square 55/September 4, 2012: Several controlled blasts are likely within the next few weeks as this phase of work concludes. Project work on the site over next two weeks includes: Fulbright area – continued concrete operations, begin waterproofing installation; Building K area – continue waterproofing and installation of footing rebar; south and east elevations – continue excavating wall footings. Square 55/August 20, 2012: The first of two tower cranes was erected August 18, 2012. Upcoming work over the next two weeks includes continued removal of rock, installation of wall footings, waterproofing installation in the Fulbright east area, rebar installation in the wall footings of Building K area, and continued concrete operations on the east elevation. Square 55/August 10, 2012: Temporary Street closures scheduled for August 11-12/this weekend. On Saturday, August 11, 2012 street closures will take place on the 800 block of 24th Street, NW (24th Street from H Street to New Hampshire Avenue). This is to facilitate installation of construction equipment and per approved DC permits, equipment arrival will begin as early as 5:30 a.m. and installation work will begin at 7:00 a.m. with work expected to be completed by early evening, at which time the vehicular lanes and sidewalks in this block will be re-opened. On Saturday, August 11, 2012 & Sunday, August 12, 2012 street closures will also occur on the 2200 block of H Street, NW (H Street between 22nd & 23rd). To facilitate installation of the tower crane for the Science & Engineering Hall project, the 2200 block of H Street will be closed to vehicular traffic except for access to parking garage from 22nd Street only (no 23rd Street access to H Street). Staff will be on site to direct traffic accessing garage. Per approved DC permits, equipment arrival will begin as early as 4:00 a.m. and installation work will begin at 7:00 a.m. work is expected to be completed by Sunday evening at which time the vehicular lanes and sidewalks will be re-opened. Square 55/August 3, 2012: After a long period of no daily controlled blasting activities at the Science & Engineering Hall site, this activity resumed August 2, 2012. Depending on site conditions, there is a possibility of additional blasts within the next several weeks. Tower crane footing will be installed next week with anticipated installation of the tower crane on August 11, 12. Upcoming work over the next two weeks includes removal of rock and installation of rock bolts for concrete. Square 55/July 23, 2012: Anticipated upcoming work over the next two weeks includes continued installation of vertical bars/toe ties throughout site and proceeding of excavation on south and east elevations to next lift of rock/clay. Controlled blasting is not likely to commence again until the southern end of the site is fully excavated and operations move northward again. The amount of blasting remaining is expected to be minimal. Square 55/July 9, 2012: Anticipated upcoming work over the next two weeks includes completion of fourth tier tiebacks as well as continued hauling of rock, soils, and rubble and the installation of rock bolts and shotcrete in the southern and eastern edges of the site. Additionally, rock excavation and shotcrete operations along the east side of Fulbright will occur. Controlled blasting is not likely to commence again until the southern end of the site is fully excavated and operations move northward again. The amount of blasting remaining is expected to be minimal. Square 55/June 26, 2012: Work will not occur on Wednesday July 4 in observance of Independence Day. Anticipated upcoming work over the next two weeks includes completion of third tier tiebacks as well as continued hauling of rock, soils, and rubble in the southern and eastern edges of the site. The underground storage tank between Munson and JBKO is scheduled for removal in coming weeks. Controlled blasting did not occur last week to facilitate continued removal of old ramp on the south end of the site. Blasting operations will likely be sporadic (once or twice a week) between now and mid August as mass excavation continues. Square 55/June 18, 2012: Controlled blasting did not occur last week to facilitate continued removal of old ramp on the south end of the site. Hauling of rock, soils, and rubble continues in the southern and eastern edges of the site, as well as lagging and tie-back operations. With rock mass excavation and controlled blasting complete at the Building K area of the site, controlled blasting and rock excavation focus now shifts to the eastern side of the site and the area under the old ramp (southern half of site). Blasting operations will likely be sporadic (once or twice a week) between now and mid August as mass excavation continues. Square 55/June 4, 2012: Controlled blasting did not occur last week to facilitate continued work to complete the new entrance ramp on the north side of the site (allowing trucks to exit site at the north end near Eye Street instead of the south end near H Street). Rock excavation and earthwork focus continues at Building K footprint. Additionally, excavation and perimeter shoring efforts at the old ramp location continues. Square 55/May 2, 2012: While it was initially anticipated when blasting began in late April that this activity would take place on most weekdays (depending on weather and soil conditions) between 10:30-11:00 a.m., site logistics necessitate increased flexibility as to the timing of when each day’s blast will occur. As such, controlled blasting activities will now occur at either approximately 11:00 a.m. or Noon weekdays (again, depending on weather and soil conditions) on the days that blasting is required. This change will be in effect through the duration of blasting activities which are anticipated to continue through late June or early July. Controlled blasting did not occur for most of last week due to efforts to complete new entrance ramp on the north side of the site (allowing trucks to exit site at the north end near Eye Street instead of the south end near H Street). Rock excavation and earthwork focus continues at Building K footprint. Square 55/May 14, 2012: Controlled blasting continues in the middle of the site most days, weather permitting, and is progressing toward the Building K footprint. Adjustments continue to be made to original approximate 10:30 a.m.-11:00 a.m. timeframe window for blast times on weekdays. Recent foundation work includes continued installation of vertical bars and toe ties along 22nd Street and Fulbright North. Earthwork includes continued work at Building K footprint and Fulbright east, continued rock excavation at Building K footprint and Munson south, and continued development of new entrance ramp on the north side of site. Square 55/May 4, 2012: Controlled blasting continues in the middle of the site most days, weather permitting, and is progressing toward the Building K footprint. Original approximate window of 10:30 a.m.-11:00 a.m. may be increased by one hour so blasting may occur between 9:30 a.m.-11:00 a.m. Recent foundation work included installation of vertical bars and toe ties along 22nd Street and Fulbright North. Earthwork includes continued work at Building K footprint and Munson south and development of new entrance ramp on the north side of site. Square 55/April 27, 2012: The first controlled blasting in the middle of the site occurred on April 26 at apx. 10:50 a.m. Additional blasting will continue each weekday for 4-5 months between 10:30 a.m. to apx. 11:00 a.m. depending on weather and soil conditions. Recent foundation work included installation of vertical bars and toe ties an Munson Hall (which will continue at Fulbright north). Earthwork includes continued work on new entrance ramp on the north side of site and continued excavation/removal of rubble in the middle or project site and along 22nd Street. Square 55/April, 2012: Excavation has progressed to the point that the contractor for this project will begin controlled blasting activities on the project as soon as April. These activities are highly monitored to ensure they are within regulated limits, do not adversely affect any adjacent structures, and have minimal impact on day-to-day routine of those living an working in close proximity to the site (the same as experienced in 2008 during the several months of controlled blasting at the Square 54 for The Avenue). When blasting begins, it will occur on most, but not all, weekdays typically between 10:30-11:00 a.m. For many, the most noticeable part of this activity will be the series of air horns that sound to notify the worksite and the public of the activity at 15 minutes, five minutes, and one minute prior to the blast, and immediately following the blast to indicate "all clear." The blasting activity itself will result in limited sound and vibration impacts that have been compared to that of a door slamming or a large truck passing and that last, at most, a few seconds (this will vary depending on a number of factors, including weather and site location). Since this activity agitates soil, occupants of buildings immediately adjacent the site are asked to keep windows closed during the blasting period (residents will not need to evacuate building during this adjacent to the site will be closed temporarily in the few minutes before and during each blasting event and adjacent streets will be temporarily closed for a few minutes during the blasting events (at the direction of D.C. Metropolitan Police and with exceptions for emergency vehicles). Blasting materials will not be stored on site. Square 55/April 13, 2012: While excavation efforts have yet to discover rock that requires controlled blasting for removal, it appears this may occur within the next several weeks. This sort of timing fluctuation is typical when working with a large project site that has varying soil conditions and will not impact the project's scheduled completion in late 2014. Related to this, there will be a delivery this Saturday of the mats used to cover the ground in the construction site on and near the blasting activities. Recent foundation work included completion of tieback drilling on the north side of Fulbright as well as continued installation of lagging on 22nd Street and south side of Munson Hall, and third tier cross lots. Earthwork includes continued work on new entrance ramp on the north side of site and continued excavation/removal of rubble in the middle or project site and along 22nd Street. Square 55/April 6, 2012: Foundation work included continued installation of lagging on 22nd Street, tiebacks on north side of Fulbright Hall and south side of Munson Hall, and third tier cross lots. Earthwork includes completion of ramp relocation to run along H Street as well as continued excavation and removal of rubble in the middle or project site and along 22nd Street. Controlled blasting activities are now anticipated to begin in mid to late April. Square 55/March 23, 2012: Foundation work included continued installation of lagging at H Streets, tiebacks at east side of Fulbright and southwest corner of site, and third tier cross lots. Earthwork includes continued excavation and demolition of remaining below grade garage structure, as well as hauling of rubble and steel, including use of hoe-ram in the first layer of rock in the cross lot area. Controlled blasting activities are now anticipated to begin in late March or early April. Square 55/March 9, 2012: Foundation work included continued installation of lagging at 22nd and H Streets, tiebacks south of Munson Hall near 22nd Street, and third tier cross lots. Earthwork includes continued excavation and demolition of remaining below grade garage structure, as well as hauling of rubble and steel. Demobilization of major equipment (crane) will occur in next week and should have little to no impacts on vehicular or pedestrian access. Square 55/ March 2, 2012: Over the next two weeks the following activities will be occurring onsite: the third tier of crosslot bracing between JBKO and Munson Halls will be installed; tie-backs east of Fulbright Hall and along H Street will be installed; angled steel supports will be installed east of Munson Hall; the large mobile crane will be removed from the site on Saturday, March 10th which will require a partial road closure on H Street between 22nd and 23rd Streets - which may require brief restrictions of vehicular traffic lanes which will be facilitated by construction personnel. Additionally, excavation and below grade demolition will occur east of Fulbright Hall and along H Street, 22nd Street, and both south and east of Munson Hall. Major deliveries will include steel deliveries for the crosslot bracing and the angled steel for the north end of the site which should not cause any road closures. Square 55/February 26, 2012: Demolition of below grade structure and concrete/rubble removal to the second tier tieback elevation continues east of Munson Hall and along 23rd Street. Excavating, lagging, and drilling ties continues in the second tier along 22nd Street. Tieback installation occurs at various locations throughout the site. Installation continues on third tier supports for cross lot bracing as does installation of vertical bars at the base of piles in the cross lot area. Clark Construction completed installation last Saturday of its trailer for administrative uses on the H Street on side of the project. Square 55 / February 17, 2012: This Saturday (February 18), Clark Construction will install a trailer for administrative uses on the H Street on side of the project which may require brief restrictions of vehicular traffic lanes which will be facilitated by construction personnel. Work will occur on Monday February 20 (President's Day Holiday) but will adhere to the adjusted work hours used during final exams periods: limited construction allowed at 7:00 a.m. start time - no exceptionally noisy work before 9 a.m.. Excavation continues at the cross lot area to the elevation of the third tier of cross lots. Demolition of below grade structure and concrete/rubble removal to the second tier tieback elevation continues east of Munson Hall and along 22nd Street. A second cut will occur near the east side of Fulbright Hall, working toward the project's H Street entrance ramp. Tieback installation occurs at various locations throughout the site. Installation continues on third tier supports for cross lot bracing. Square 55/February 13, 2012: Ongoing excavation efforts include removal of soils (east of Fulbright and Munson Halls) and below grade rubble and steel. Removal of soils under the cross-lot bracing will be underway as well. Below grade demolition of 1971 and 1999 portions of UPG continues, especially east of Munson. Sheeting and shoring efforts include installation of tie-back systems (along H Street/south of Munson), and wood lagging at various locations of the site as they are excavated. Some work during the next week may produce intermittent periods of increased vibrations/noise near Munson as removal continues of below-grade west wall of the 1999 portion of UPG. Also, PEPCO has planned to replace transformers at the northeast corner of the site -- however, the exact date and time has not yet been determined. This work should occur inside the construction fence and is unrelated to the Science and Engineering Hall project. Square 55/February 3, 2012: Some work during the next week may produce intermittent periods of increased vibrations/noise near Munson Hall and Fulbright as removal continues of below-grade portion of the west wall of the 1971 portion of the University Parking Garage. Replacement of excavation equipment will take place along 22nd Street on March 6 -- traffic will remain open and be diverted around this loading activity. Work will begin soon by PEPCO to replace transformers at the northeast corner of the site. Although this work will likely occur inside the construction fence, it not related to the Science & Engineering Hall project. More details (including days/times) will be shared when they are made available by PEPCO. Ongoing excavation efforts include removal of soils (east of Fulbright Hall and south of Munson) and below grade rubble and steel. Below grade demolition of 1971 and 1999 garage continues. Sheeting and shoring efforts include installation of tie-back systems (along H-street and South of Munson), and wood lagging at various locations of the site are excavated. Structural steel will be installed on the soldier piles along Eye Street as well. Square 55/January 27, 2012: Some work during the next week may produce intermittent periods of increased vibrations/noise near Munson and Fulbright Halls as removal continues of below-grade portion of the west wall of the 1971 portion of UPG. Ongoing excavation efforts include removal of soils (east of Fulbright Hall and along 22nd Street) and below grade rubble and steel. Below grade demolition of 1971 and 1999 garage continues. Sheeting and shoring efforts include installation of tie-back systems (near Fulbright Hall), cross-lot bracing, and wood lagging at various locations of the site are excavated. Square 55/January 19, 2012: Drilling of piles on site is complete. Installation of trailer platform on the project's south side continues. Work has begun on the next tier of cross lot support beams on the project's west side. Lagging and tiebacks continue at various site locations. Excavation of soil and existing below grade rubble/steel continues in all areas of the site except where the cross lot support. Square 55/January 12, 2012: Security lighting has been installed at the project site and this lighting will remain on overnight to provide security for the project site. Please contact [email protected] if this lighting impacts your room when blinds are closed. Similar lighting may also be required at the Law Learning Garage site later this semester. trucks/dumpsters with large rubble or scrap metal (soil is permitted); jack hammering; driving of piles; repeated/continuous honking/idling in vicinity of residence halls, and; loud/boisterous outdoor conversations within close proximity to residence halls. Although the university will be closed on Monday, January 16 in observance of the Martin Luther King, Jr. Holiday, work will take place at the project site in accordance with hours noted above. Current work includes: drilling piles complete around perimeter of site; lagging and tiebacks continue at various site locations; excavation of soil continues below cross lot area, east of Fulbright Hall and east of Munson Hall, and; demolition of remaining existing below grade structure continues, including hauling of rubble and steel. Square 55/Dec 21, 2012: After GW's final exam period concludes on December 21, the university will lift its prohibition on early morning exceptionally noisy activities (7-8am weekdays, 7-9am Saturdays) so all work activities may begin starting at 7am. Beginning Saturday January 15, 2012, the prohibition on construction activities likely to be exceptionally noisy to 8:00am on weekdays and 9:00am on Saturdays will resume (to clarify, workers can work beginning at 7am but it should not include activities defined as “exceptionally noisy”: surface scraping and asphalt/concrete demolition; filling of dump trucks/dumpsters with large rubble or scrap metal (soil is permitted); jack hammering; driving of piles; repeated/continuous honking/idling in vicinity of residence halls, and; loud/boisterous outdoor conversations within close proximity to residence halls. In observance of the holidays work will not occur on Monday December 26 or Monday January 2. Drilling of steel soldier piles along 22nd Street. and along the Southern side of JBKO/Munson. Mass excavation and foundation debris removal will occur from 23rd Street eastward along the southern edge of JBKO and Munson. Mass excavation east of Fulbright will begin. The construction entrance ramps will be relocated. Surveying of foundation and building monitoring will be ongoing. Perimeter lights will be installed for evening work that occurs after dark. Installation wood lagging boards between the steel soldier piles along 23rd Street and along the southern side of JBKO/Munson. Concrete bracket pile installation under JBKO building footings will be completed in the next week. Recognizing the importance of the upcoming Final Exam period, we are extending the prohibition on construction activities likely to be exceptionally noisy to 9:00am on weekdays (remember, workers can work from 7–9:00am during this time, but the work may not include activities that are defined below – also, regular work may commence after 9:00am). Additionally, work will not occur on Saturday, December 17, 2011. If you have questions regarding construction activities that have been prohibited during early hours due to their likelihood of resulting in exceptionally noisy conditions, please email either [email protected] or [email protected] or tweet @GWDOSHelps. We also urge you to use any of these contacts if there has been a violation of these prohibitions (please share as much information as possible, especially time of day/type of noise) so we can immediately follow up with the construction team. Square 55/December 2, 2011: Drilling activity on the southeast side of the project continues. All drilling is anticipated to finish by end of the year. Drilling along the east side of Munson should wrap up in coming weeks. Grout tube installation at south side of Munson is ongoing. Excavation from 23rd Street and moving eastward along the south side of JBKO and Munson is underway. Installation of lagging boards along the west and northern edges of the excavation will follow the excavation work. Bracket pile installation at east side of Fulbright to complete early this week. Underpinning at the top of drilled bracket piles will commence at Fulbright this week. Once these are complete, underpinning at Munson will commence. Underpinning pits at JBKO are complete. Work on the existing east façade of Munson will continue including installation of additional drilled anchors on the exterior. Square 55/November 18, 2011: Drilling activity on the west side of the project near Fulbright Hall continues as well as at other areas around the site. Work continues on underpinning pits near JBKO with expected completion this week. Pile installation continues in vicinity of Fulbright and Munson Halls. Soldier pile drilling continues at southwest corner of site. Grout tube installation near Fulbright is complete. Excavation activities will commence working from west to east just south of JBKO and Munson. Additionally, work on the existing east façade of Munson will commence including installation of drilled anchors on the exterior and the installation of a block wall on the interior. Square55/November 11, 2011: Processing/removal of demolished material from below-grade portion of 1971 garage and 1999 garage continues as part of the sheeting, shoring and excavation process. Drilling activity on the west side of the project near Fulbright Hall continues as well as at other areas around the site. Work continues on underpinning pits near JBKO and Munson. Pile installation continues in vicinity of Fulbright and Munson Halls. Soldier pile drilling at 23rd Street is complete and progressing to southwest corner of site. Square 55/November 4, 2011: As part of the construction of the Science & Engineering Hall, PEPCO will be pulling wire the week of November 7 at night on 22nd Street between H and Eye Streets - crossing H street to the corner of Gelman library. The work was scheduled at night by the Pepco due to the level of traffic from pedestrians and cars in the area. The work is anticipated to start at midnight each night and will last thru Thursday night and should not be noisy. Please contact either [email protected] or [email protected] if you have additional comments/questions. Also, additional light stands will be installed around the site and be used in the late afternoon hours beginning Monday November 7 due to the time change. These lights will be used only during permitted work hours (Monday to Saturday, 7am-7pm). Please contact [email protected] or [email protected] if these lights create a disturbance. Processing/removal of demolished material from below-grade portion of 1971 garage and 1999 garage continues as part of the sheeting, shoring and excavation process. Drilling activity on the west side of the project near Fulbright Hall continues as well as at other areas around the site. Work continues on underpinning pits near JBKO and Munson. Pile installation continues in vicinity of Fulbright and Munson Halls. Square 55/October 28, 2011: Processing/removal of demolished material from below-grade portion of 1971 garage and 1999 garage continues as part of the sheeting, shoring and excavation process. Drilling activity on the west side of the project near Fulbright Hall continues as well as at other areas around the site. Work continues on underpinning pits near JBKO and Munson. Pile installation to begin in vicinity of Fulbright and Munson Halls. Square 55/October 21, 2011: The official groundbreaking ceremony for this project was held last night and attended by hundreds of students, faculty, staff, alumni, neighbors, and friends of the university. Processing/removal of demolished material from below-grade portion of 1971 garage and 1999 garage continues as part of the sheeting, shoring and excavation process. Drilling activity on the west side of the project near Fulbright Hall continues as well as at other areas around the site. Work continues on underpinning pits near JBKO and Munson Hall. Pile layout has begun at various site locations. Square 55/October 14, 2011: Processing and removal of the demolished material continues. Removal of below-grade portion of 1971 garage and 1999 garage continues as part of the sheeting, shoring and excavation process. Drilling activity on the west side of the project near Fulbright Hall continues as well as at other areas around the site. Work on the JBKO and Fulbright walls is complete. First dewatering pit has been installed on north side of Fulbright and work continues on underpinning pits near JBKO. Square 55/October 6, 2011: Processing and removal of the demolished material will continue for several weeks. Removal continues of below-grade portions of the former parking garages as part of the sheeting, shoring and excavation process. Drilling activity on the west side of the project near Fulbright Hall continues as well as at other areas around the site. Work is nearing completion on the south wall of JBKO residence hall. Square 55/September 29, 2011: Above-grade demolition of the 1971 and 1989 garages is complete: processing and removal of the demolished material will continue for several weeks. The large orange high reach excavator was demobilized. Below grade portions of the both parking garages will be removed as part of the sheeting, shoring and excavation process. This process has started with drilling activity on the west side of the project near Fulbright Hall. In addition, work will take place for next one-two weeks to drill anchor placements on the south wall of JBKO residence hall. Square 55/September 22, 2011: Demolition of the 1971 garage continues with removal of above grade structure to be finished early next week and then below grade demolition on both the 1971 and 1989 structures to continue for several weeks, leading into excavation which will be ongoing for rest of the academic year. The drill rig for in preparation for sheeting and shoring continues work on the west side of the project near Fulbright Hall. Square 55/September 15, 2011: Demolition of the 1971 garage continues and is anticipated to reach grade level during the next week. Upon completion of above grade demolition the "high reach" demolition crane will be dismantled. Demolition work continues on below grade levels of the 1989 garage, as well as underpinning and preparation for upcoming excavation and sheeting/shoring activities." Square 55/September 8, 2011: Demolition of the 1971 garage continues over the next several weeks until reaching grade level. Work continues on below grade levels of the 1989 garage. Underpinning work is underway on JBKO as well as some patching of exterior walls. Following demolition, excavation, sheeting, and shoring to grade will begin. Square 55/August 29, 2011: Demolition work on the 1999 parking garage has progressed to ground level. Demolition work on the 1971 parking garage continues. Square 55/August 15, 2011: The temporary trailer to house on-site construction managers/workers was installed in late July. 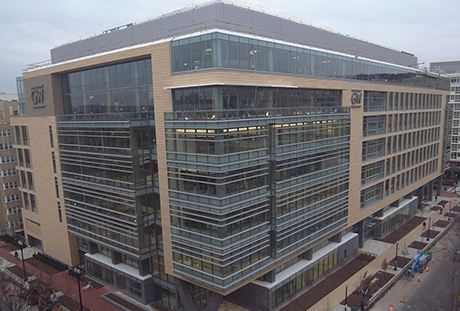 Demolition of Building K on 23rd Street, NW is complete. Demolition work on the 1999 parking garage has progressed down six levels, with a floor being removed approximately every four days. Demolition work on the 1971 parking garage began last week and will proceed from the structure's western portion to the east.